Salmon Fishing Lets go fishing for the "king of fish"
But if we had of asked him for the formula for “the best place to go Salmon Fishing” we would probably have no idea who he is today. Why? simply because relativity is something quantitative where as Salmon are a whole new ball game. The form, shape, flow, depth of a river have nothing to do with why the Salmon is there. Simply put the salmon is there through genetics. 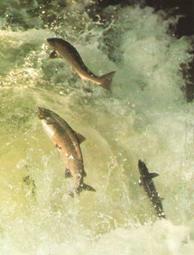 For the Salmon – where it was born it has to go back to to breed. Salmon Fishing – Where are they at? As we said above Salmon are creatures of habit, they come back to the place of their birth and this is to the benefit of the fisherman. By knowing they are going to come home we can have a good idea where they are going to be in the river. When it comes to Salmon Fishing you have a better chance of catching something if you know the water you are fishing. Knowing where the holes, boulders, over hanging tree, etc.. are the better chance you have of finding a feeding fish. I said “feeding” because not all Salmon are feeding while in an area. Fish that are “running” are will not be eating and you are wasting your time chasing after one. (running means the fish is moving up stream and not interested in eating – so save your energy).